First, I just want to thank everyone for your kind comments on my "A Million Thanks" post! You all are seriously making me blush and I am looking forward to coming up with new ideas for tutorials and quilt alongs for everyone! It's going to be a great year I think. 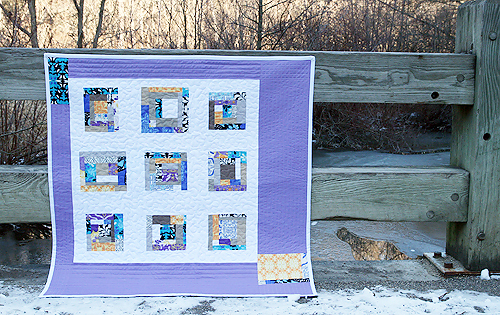 And I'm happy to share my first quilt of this new year, Morning Tides. Designer Mark Cesarik sent me a bit of his fabric collection last month and I knew right away that I wanted to make improv blocks with it. I incorporated a few shades of tan and some white into the blocks. They are all a bit different in size. I sashed them in white then to make the center of the quilt. I can't take credit for the idea of off-centering the main focus of the quilt. Heather did this last year and I loved it! So I added a border of purple, wider on the right and bottom sides. I also added in a bit more of the Morning Tides fabric for added interest. 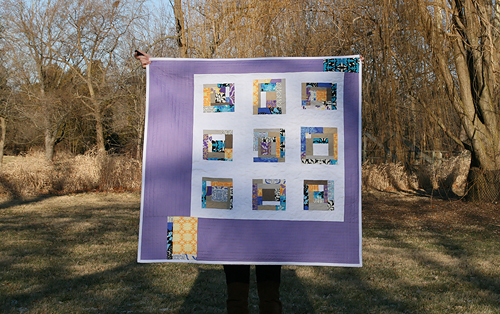 The purple is FreeSpirit Designer Solids Lavender and it is a perfect match. 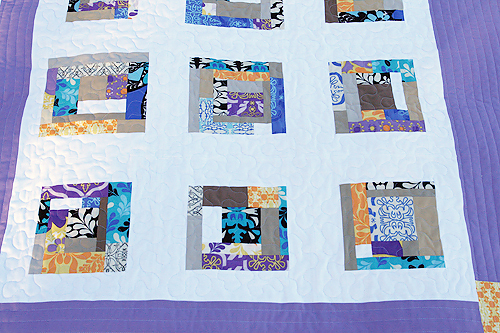 I quilted the blocks and white portion of the quilt in a meandering, free motion style. 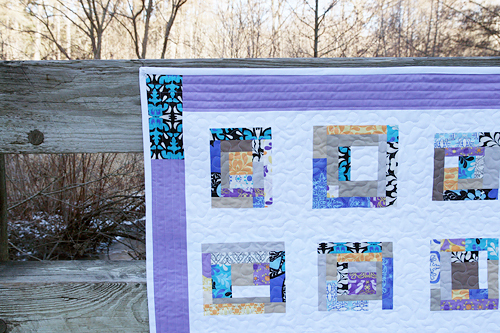 Then I quilted the purple border with straight lines, spaced about every 3/4". I went out yesterday in the freezing cold to try to get some photos with my camera's remote. I was laughing at some of the photos when I got home. "Is this thing working??" And then half the photos were like this - sideways! Oh well, live and learn!